A valve body formed by a cast alloy allows for a wide range of valve design configurations and minimizes the amount of metal machining. Some degree of metal finishing and polishing may still be required to achieve the required finish specification for internal food-contact surfaces and external finishes for cleaning and appearance. Valves and parts manufactured from wrought alloy begin as cast ingots that are worked into the approximate shape and dimensions, and then machined to create the required configuration, cavity spaces, etc. This process provides additional mechanical properties to the metal. High precision parts, and divert and mix-proof valves are manufactured in this manner. Standards agencies have devised nomenclature to describe the composition of the metal and whether it has been cast or wrought. Most people are very familiar with the wrought alloy designations (304 SSL and 316 SSL) established by the American Iron and Steel Institute (AISI). Stainless steel castings are specified by the Alloy Casting Institute (ACI) designations. These cast components are sometimes identified with an alpha-numeric code embossed on the exterior to reflect the composition of the metal. The table below provides the correlation between the same metallurgical composition in the cast and wrought forms. 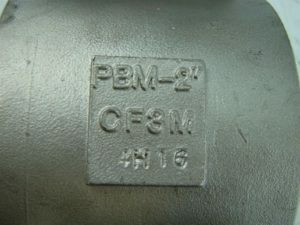 The wrought metal equivalent for the metal in this valve is 316L stainless as defined by the AISI.